On Sunday, December 6th at 2 p.m., thirteen families brought their child, or children, to celebrate the sacrament of First Reconciliation! Each child emerged with a BIG smile on their face. Parents and siblings were also encouraged to take advantage of the opportunity to celebrate the sacrament with Fr. Josh and Fr. Bryan who generously served our people this day. After receiving the sacrament the child would meet their family at the base of the altar to light a candle from one of the Advent candles, signifying the light of Christ that shines from within each of us as we take steps during this season to prepare our hearts for his coming! Thank you, Jesus, for the gift of Reconciliation!! An opening meeting for parents and child with Vicki Conder and Fr. Tom Buckman, with materials provided for parents to update their own understanding and participation in the sacrament. It will be held on Tuesday, Sept. 20, 2016 @ 6 p.m.
A second meeting for parents only, with catechesis and faith sharing around the sacrament of Reconciliation will be held on Tuesday, Oct. 18, 2016 @ 6 p.m.
Six take home packets for parents' use in teaching their child about the Church's teaching concerning this sacrament of healing. Scripture stories, faith sharing, and interactive puzzles and games will be included. See "Growing Up Catholic" below. A "Let's Talk" appointment to wrap up everything your child has learned, answer questions, address concerns, and support your family in whatever way you may need. These will be scheduled at parent's convenience between Nov. 21 - Dec. 9. A celebration of the sacrament of Reconciliation with all participating families!! Happy, Happy Day!! First Reconciliation this year will be Sunday, December 11, 2016 @ 2 p.m. Anyone interested in having a child prepare for the sacraments of Reconciliation and Holy Communion should contact Vicki Conder at the parish office, at 270-684-4745 or vicki_conder@bellsouth.net. If your child was baptized in a parish other than St. Pius X in Owensboro, KY, please obtain an official Baptismal certificate from the original parish. It will be necessary for our records. 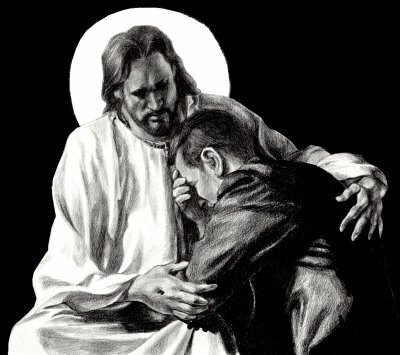 Go to the Catechism of the Catholic Church [CCC] -- paragraphs #1420 + to find the Church's official teaching on the Sacrament of Reconciliation. Just click on this image of the CCC, then scroll down to paragraph #1420. You will find a beautifully written teaching on this sacrament handed down to us by our Church who teaches us with the authority of Jesus! Bustedhalo.com has a fantastic teaching on each of the sacraments in a series they call "Sacraments 101". Take five minutes and nine seconds to listen to their explanation of why we confess our sins to a priest! ​Watch as BustedHalo teaches you how to receive the Sacrament of Reconciliation in Confession 101: part 1 & part 2. For a Catholic Teaching on Reconciliation click here. ​Jesus gives all of us good instructions on how to move closer to the Kingdom of Heaven as He loves the little children in Mark 10: 13-16. Sometimes we make things so complicated! Jesus is telling us here that simple and child-like is the way!! There is a reference to Sabbath School in the very beginning. Just explain to your child that we use the term Sunday School, or in our parish, Families in Faith! Other resources for Week #1 from "Growing Up Catholic"!! This story is one that I can see myself in . . . . . actually in all three of the characters! Help your child to stand in the shoes of each of the sons. Neither child had perfect behavior! Identify with them what each did wrong, then how the second son turned his bad choice into a very loving choice that ended up giving him a wonderful afternoon with his dad!! Other resources for Week #2 from "Growing Up Catholic"!! In Luke 10: 25-37 Jesus teaches the people what it means to REALLY "love your neighbor as yourself". After watching, ask yourself, "How do I want the people around me to treat me when I am hurt? What do I do when I see someone hurting another person -- either physically, or hurting their feelings? Is it hard for me to show love for people who are not liked by others? How can I do this even when it is hard?" Other resources for Week #3 from "Growing Up Catholic"!! ​There are several scripture stories where Jesus demonstrates the merciful love of God, our Father. One of these, called "The Prodigal Son", can be found in Luke 15: 11-32. Here are the SKIT GUYS telling this Bible story in their own unique style that will warm your heart. Watch it with your child, then talk about how much God loves each of us, and when we turn away from Him in sin, all He wants is for us to return to Him! Other resources for Week #4 from "Growing Up Catholic"!! Jesus puzzled the people who were close to Him A LOT!! Watch this story about the woman who made so many bad choices, and how she expressed her sorrow to Jesus. Our sins can never outdo God's mercy and love! This woman found the peace she was looking for at the feet of Jesus in Luke 7: 36-50. Other resources for Week #5 from "Growing Up Catholic"!! Zacchaeus didn't have any friends, because he acted so badly all the time. He made unloving choices that hurt the people around him. But when he heard that Jesus was coming to town something started to change in his heart. All he knew was that he wanted to see Jesus . . . . . and he was willing to do whatever it took to be able to see Jesus better! Are we willing to do whatever it takes to know Jesus better . . . . . even if it makes other people look at us funny??? Other resources for Week #6 from "Growing Up Catholic"! !